Roberta Shaffer (moderator) - we've come a long way historical. The right to privacy is not a new one. The right of privacy is infused with many type of relations. She questioned whether we can be forgotten, which is part of the right of privacy. It may not be technically possible. In the US, privacy is often controlled by the Federal Trade Commission. 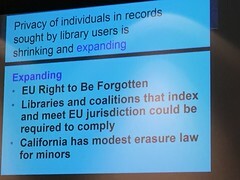 In Europe, the right to be forgotten. In Europe, the right to be forgotten makes a lot of sense. In the US, we see this as true information, which should be available. He mentioned lawsuits in France and Italy, where the right to be forgotten or the right to privacy had been upheld. The right of the people to be secure in their persons, houses, papers, and effects, against unreasonable searches and seizures, shall not be violated, and no Warrants shall issue,but upon probable cause, supported by Oath or affirmation, and particularly describing the place to be searched, and the persons or things to be seized. This conflict is relevant outside of the US and Europe. Many countries has adopted the European model. How to think about this conflict? 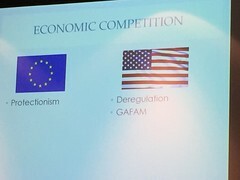 One way of thinking about it in terms of economic competition. GAFAM = Google, Amazon, Facebook, Apple and Microsoft. 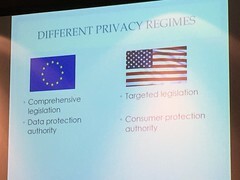 In Europe, the privacy regulations are seen as protectionism. But the US and Europe have two different cultures of privacy. 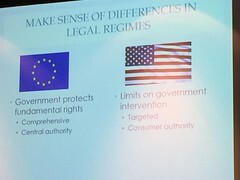 Europe is focused on dignity, while the US is focused on liberty. There is a long tradition in Europe of reputation and honor; your public face. This was a right of the noble classes, which became a right of everyone. It became a human right. Each has a right to personal dignity. In the US, we got rid of the monarchy. We believe that we have the right to make decisions free of state interference. Our anxiety is that the government would get a hold of all of our private information. We do not want an overbearing government in our private lives. In the US, we don't want the government to limit what we can know. How dose resolve the conflict over privacy? Both come out of a western tradition. Can we blend dignity with liberty? Perhaps there is something in the Universal Declaration of Human Rights. 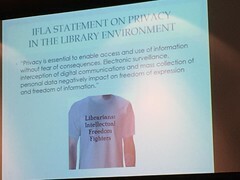 What about intellectual privacy? There is a book on that. 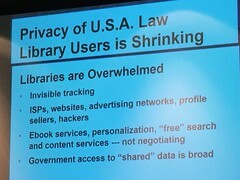 The privacy of library users is shrinking. 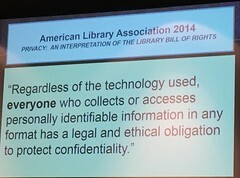 The private information of individuals, whom a library user might be researching, may be increasing. We want to increase the privacy of our users as well the privacy of the people on our content. We want to increase access to content. We want to limit surveillance, including watching what people are accessing. In the US, privacy laws are at the state level. Some were passed in the wake of the Freedom of Information Act. Laws in 48 states, the District of Columbia, and attorney general opinions form the basis for this. Some states have laws about digital book services. There is a new law in Delaware, for example. Legal research itself is part of the client-lawyer confidentiality. There has been growth of data brokers, who combine information from across the web, and then sell the resultant information. Data brokers may create discriminatory sounding categories, which can harm a person's dignity. They address key library legislative issues with Congressional representatives. Section 215 expired briefly and then was renewed by the USA Freedom Act on 2015. This Act ended the bulk collection of the NSA, but requests can be made. The gag order of Section 2015 now is subject to judicial review. The secret court rarely said "no" to requests. Now advocates/watchdogs can be at the proceedings. The cybersecurity Information Sharing Act now makes the NSA the collector of information, she something fishy happens,and that information is shared with other agencies. The Electronic Communications Privacy Act - This act was passed in 1986 and it has not been amended since then. In 1986, people dod not store long term. If data is over 180 days old, a warrant is not needed. There is activity in a congress to change this act, however, people are also looking to expand the PATRIOT Act. What about encryption or digital "back doors"? This is a huge debate currently in the US. People want stronger encryption. The government wants to get around encryption. Can the government compel a company to break encryption? Will the government study this to death? He noted that the President in the US can issue an Executive Order, which can impact privacy. He mentioned Rule 41, which is about hacking. Hirsch - in the privacy of readers, dignity and liberty are combined. When it comes to content, dignity and liberty are in conflict. We need to find creative ways to synthesize liberty and dignity. Eisgrau - expunging versus contextualizing. What about providing more information in order to provide context? Given our technology, is an expunging possible? Shaffer - there is a balance in people's minds between privacy and convenience. In the US, we have felt that the government would protect our privacy. However, security breaches in the US demonstrate that the Government is not protecting our privacy. In Germany, they do not trust the government and felt that corporations would protect their privacy. However, breaches show that corporations are not adequately protecting people's privacy. Hirsch - privacy has political and cultural contexts in different countries.